In June this year, the LVMH group announced that it would be buying the Arnys menswear store on Rue de Sevres in Paris, and converting it into a branch of Berluti, which it has recently expanded into a full menswear brand. This was a crying shame. Arnys was one of the few truly original menswear stores left in the world – somewhere you would travel to visit and could find nowhere else. Of all the craft-based brands I explore on this site, the vast majority are stocked in the world’s biggest cities, and are usually available to buy online. Arnys was small, unique and beautiful. Although some of the clothing tended towards parody, the Arnys aesthetic was successfully reapplied to new colours and materials every season. My favourite purchase from there was a pair of high-waisted linen trousers – I have never seen such a design or the wondrous linen anywhere else, in cloth books or off the peg. On the other hand, they were selling a €2000 jumpsuit in the same cloth, which was ridiculous. Last month I interviewed Jean Grimbert, one half of the sibling team that ran Arnys and designed everything in it. He claims that after he retires at the end of the year, LVMH will retain the Arnys aesthetic under Berluti creative director Alessandro Sartori. 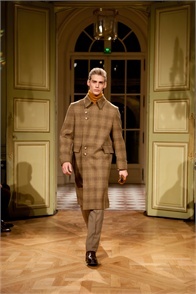 How will Arnys and Berluti work together? We will be increasing the size of our bespoke department, which will be branded as ‘Berluti by Arnys’. I am personally in charge of this and our aim is to create the greatest haute-couture bespoke house around. 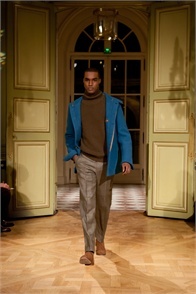 We will also make some of our distinctive Arnys casualwear, such as the Forestière jacket, on a bespoke basis. We will make everything – bespoke ties, shirts or scarves. But will you stop the Arnys readymade collection? No. First we will be shutting the shop for a complete refurbishment at the end of the year. 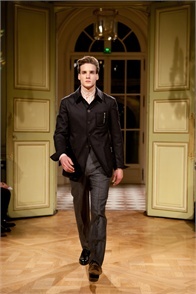 Then, when we reopen, we will have two readymade collections: Berluti and Arnys. Given what Sartori has already designed for Berluti, which was rather dark and classical, are the two aesthetics not too different? Yes and no. I think the two have the same spirit. You can see from the images from our Winter collection [shown around this post] that there are things in common. This is my last collection, I am 66 and will retire. But I have a lot of confidence in Alessandro Sartori. He is a charming man and we have talked together several times already. He likes what I am doing and vice versa. The quality of the clothing is similar, in terms of what it aims for, and there are similarities too in the contemporary nature of some of the cuts. The jackets, you can see from the images here, are that little bit shorter, and the designs often have some kind of asymmetry built in. Sartori has a similar sensibility to me and, I think, actually a similar approach to colour. What he will do, of course, will be his own creation, but he will simply design differently for the two ranges. Will the new store also keep the cufflinks, knives and other accessories that you are know for? I don’t think so, no. These were very much a personal endeavour for me, to sell these little things made by artisans in France. The little knives, you know, are made by a customer of ours. He is a doctor but has recently taken to making knives. He has set up a little atelier and produces them himself, with precious handles and beaten steel blades. The pen knives we have had for longer and are made in Sauterne, by an atelier with just three people. I’m sure we will find other places to make them available. What interesting things are in the current clothing collection? We have handkerchiefs with a different pattern on each side, made of two pieces of silk sewn together by hand. This makes them very versatile and I think we are the only one doing this. We also have a range of jackets made from shirt cloth that are wonderfully light – you could sleep in them if you wanted to. I’m also excited by the shirts we have made from printed silks and cottons. What looks like a woven houndstooth or other pattern is actually just printed on. This gives me much more control over the colours and more freedom with pattern – rather than having to work with warp and weave. The silks are all machine washable as well. This was the third time I have met Jean and I will miss him. He is wonderfully warm, enthusiastic and a uniquely creative individual. I remain sceptical about Sartori’s ability to continue the Arnys aesthetic. At the very least, the inventiveness that characterised the Grimbert collections will go: no two minds innovate in the same way. It is also easy to say that these things will carry on being made bespoke – anything can be made bespoke if you have the time and the money. I just hope some vestige of the spirit remains, and I continue to have an excuse to go to Paris. Ubiquity makes us all poorer, for the lack of variety and lost joy of discovery. You can follow the discussion on Interview: Jean Grimbert, Arnys by entering your email address in the box below. You will then receive an email every time a new comment is added. These will also contain a link to a page where you can stop the alerts, and remove all of your related data from the site. Generated the same feeling one gets from reading an obituary. Thank you for the great work you are doing running this blog. I enjoy reading it everyday. Last year you worked with Breamish Tweed in Scotland to commission a tweed fabric which I purchased. I was wondering if it will be possible to work with another fabric manufacturer to commission a linen fabric in the colours of cream and tan for the next coming summer. Hi Andie, yes I was thinking of working on something else later in the year, though perhaps a luxury cloth like vicuna or cashmere, given that is what sets them apart. I loved Arnys’ style. 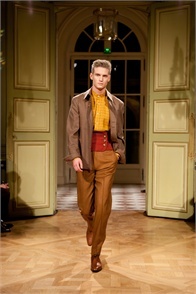 It was a magic mix between romanticism of XIX Century and modern updated way of dressing. The shop has always been a “must see” in Paris. Thanks for the post; if I had not seen it, I would not have gone there while in Paris last week when I visited. I do not consider myself overly wealthy, but recently I have discovered the pleasure of buying high quality which normally equates with higher prices. And I must admit that I was a bit intimidated walking in the store this past Monday, until there was a fellow American couple who were commenting on how much the ties cost (as an aside, you can normally pick out the male American tourists as they typically wear shorts, t-shirts, baseball caps, sneakers, and backbacks….sigh). But the saleslady was extremely polite and helpful, and once I tried on one of their silk shirts, I was sold. I also got a Forestière jacket, but passed on a very nice craval/ascot/neck scarf, which I think I am a little too young for (that, and tweed jackets with elbow pads). All sarcasm aside, it is blogs like these that have made me appreciate how high quality clothes that are properly tailored make a man. Another blog I regularly read had a quite negative post when it was initially announced that Arnys was being acquired, but that one does tend to have a more condescending view on items that they do not like, which is why I appreciate Simon and his efforts here and elsewhere to provide those of us who are looking for a kinder, gentler hand in guiding us without the overt hostility. Besides, I belief that every person has to make their own choices (bad and good) and learn from them. Once again, thank you for the article. And as an aside, how does one pronounce Arnys? As an American who does not speak French very well and has trouble pronouncing the simple phrases I do know, I would be interested to know how to say it properly. Any of you well dressed chaps know much much a three piece suit from arnys would have set you back? just looking for ball park amount..i have a gorgeous dark grey herringbone suit that a friend’s dad was getting rid of, unworn! !..and wondered what they might have retailed for! I would love to see a follow up on this story. What a sad story. There was no place like Arnys on the planet…I will miss them and miss the substance and style they represented. I will also miss Bob…the house mascot.